Picture book manuscript format flummoxes a lot of aspiring children’s book writers because there is so much potential variety. In my career, I have seen hundreds of examples of picture book format. To help you stand out in the slush as polished and professional, I’ve developed a picture book manuscript template handout that I’ve used over the years to really streamline and clarify the process for writers. Click here to download my picture book format handout as a PDF. Feel free to share! Picture book manuscript format tends to vary WIDELY. Some writers have it down. Others think they’re paginating correctly if they allocate a separate manuscript page to each line, resulting in a 32-page Word document that contains 300 words. 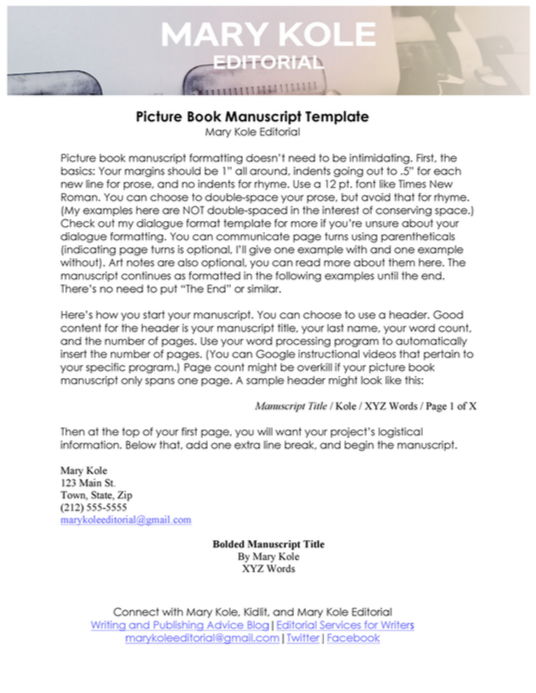 What if a picture book manuscript template existed? It would certainly streamline things. As is, some writers include illustration notes, others stay far away. How do you paginate a children’s book? How do you format illustration notes correctly? This resources answers those questions (and here are more thoughts on illustration notes in your children’s book manuscript). I’ve put together a handout that answers all these questions and more. No conference or webinar attendance required! Click this link to download the PDF. Remember that picture book format is just one small component of a successful children’s book submission. You also have your picture book query letter, and, well, the most important thing: an awesome manuscript! Don’t focus so much on picture book manuscript format that you lose sight of character, plot, and writing style. Those are going to take you a lot further than a nice-looking, polished file … but the latter certainly doesn’t hurt. That’s why I’m offering this picture book manuscript template tool to help you cross this concern off your list. As a picture book editor, I work with writers on all aspects of the picture book craft, from creating a compelling children’s book manuscript (in proper picture book format, of course!) to nailing the query letter. Contact me for personal, actionable advice on your project. This is very helpful. Many thanks. Finally someone who emphasizes the need for a good manuscript. No social media presence, no awesome query letter, no critique group (imagine that), just a compelling story. Easier said than done, but just write it friends. I couldn’t possibly agree more! But writers want to believe that it’s easier to control and focus on a one-page letter instead of trying to turn out a really amazing 300 pages. (Or 300 amazing words, in the form of a picture book manuscript.) I get it. Human nature at its best. But the manuscript really is the end all, be all, at the end of the day. Just saw your reply. Thank you. Do you give feedback on query letters? Would love to send you one. This is wonderful, Mary 🙂 It’s funny (and frustrating) how guidelines on these things can sometimes differ e.g., with page turns vs. without, etc. And I thought always double-spaced? Thank you! I am new to this, so this is helpful! Finally some info on this! I couldnt find anything on how to format it into a manuscript, some things don’t apply to children’s writing, like no space between paragraphs and I’ve always read the 2 space rule but my book is a rhyming one. Thanks for this gift I didn’t know I needed. If a PB MS is all dialogue, would you use quotes? I’m revising one now, no quotes.